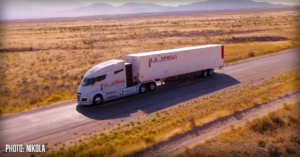 Tesla Semi Truck rival Nikola Motor Company has announced a $16 million equipment purchase for its hydrogen fuel cell laboratory, representing an initial investment of several hundred million dollars planned. The laboratory represents a critical component in Nikola’s plan to provide high-quality, high-efficiency fuel cell technology at a pace quick enough to meet the needs of the trucking industry as it drives towards an alternative-power future. “We believe the fuel cell will replace the diesel engine in the next 10 years,” Trevor Milton, CEO of Nikola stated in recent press release. “This lab will be filled with extremely talented fuel cell engineers and is a critical part in our truck development — enabling Nikola to set a new efficiency benchmark for heavy-duty fuel cell systems.” Story By Dacia J. Ferris / www.teslarati.com.